Summary: In Trentino dialect, ‘sortesele’ is the diminutive of ‘sorti,’ or “small parts of vineyard.” According to ancient custom, Sortesele were large parcels of vineyard for which the heirs of an agricultural property drew lots. 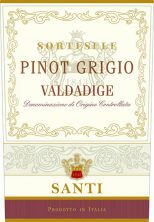 Terroir: Santi Pinot Grigio thrives in the Valdadige vineyard, situated along the Adige valley. Vinification: Following the harvest grapes are sorted and vinified entirely in temperature controlled stainless steel vats. The young wine remains in stainless steel for the short aging process and sees a light filtering prior to bottling.